During the height of radio, quiz shows were the staple of the radio community. From Quiz Kids to Information, Please, radio was saturated with 30-minute shows that pinned contestants versus contestants in a battle for intellectual supremacy. So, when It Pays to be Ignorant came along, it provided a breath of fresh air for the radio society; but the show was unlike any other quiz show transmitted through the airway. As much a comedy show as a quiz show, It Pays to Be Ignorant was the buffoon's version of a quiz show. The three quizinheimers were George Shelton, Lulu McConnell and Harry McNaughton. The quizmaster was Tom Howard. 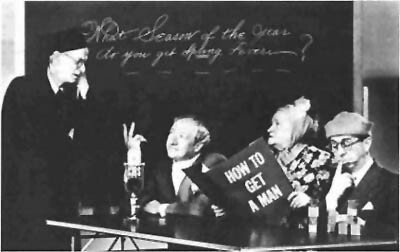 As Dunning summaries in his "On the Air, The Encyclopedia of Old Time Radio," The three nitwits who made up the "board of experts" spent most of the time trying to figure out what the questions were, between rambling monologues, irrelevancies, and rude interruptions. The questions were as moronic as the panel." 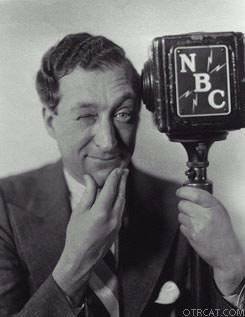 Although Dunning is not amused, the show was very popular for nearly a decade, and kept the nation laughing along with the live broadcast audience. Harry McNaughton For a half-hour each week the show careened along its way, haphazardly maintaining the semblance of quiz while really offering a vaudeville celebration of the best ways to get off a joke or zinger before the next guy. 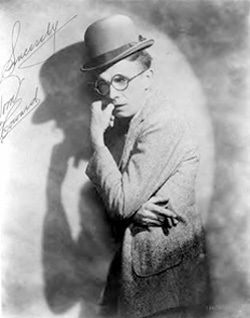 There was a young writer named Ruth, who was the daughter of a vaudevillian, Tom Howard. When her radio program director boyfriend Bob Howell came up with the goofy idea of a radio panel show like "Information, Please," but with experts dumber than the contestants, Ruth ran with it, thinking that her dear old Dad, might get a part if Bob ever actually got to do the show. The show was picked up by Mutual. The "expert panel" parts finally did go to three drawn from the ranks of vaudeville. Lulu's McConnell's character was abrasive in demeanor and raucous in tone. Tom Howard's gravel voice was equally rank as the quizmaster. Harry McNaughton was an Englishman who made a vain attempt at propriety, and always failed. George Shelton had been Tom Howell's partner on the stage, and still got off a running patter. The three "experts" were like the Three Stooges doing a quiz show, but less formal. The show was panned as it got started, but the public thought it was a hoot. Not the owl kind of course. 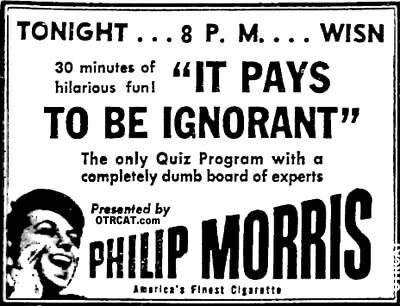 Actually, it barely paid to be ignorant on the show, as the questions were pulled from a dunce cap, fumbled with, and if answered correctly, the winnings were so little as to be positively hilarious. But who cared what the answers were? The chaos of the show might now be considered positively prescient, as the devolution of formal entertainment, and ad lib humor are both still very popular today in our new century of multimedia choices. As for Bob and Ruth Howell, they got married sometime during a crazy dream come true, and together they laughed happily ever after. "Information, Please," the lampoonee, is also available for your auditory perusal. For more free-form humor, please see You Bet Your Life, I'm Sorry, I'll Read that Again, and The Goon Show, which can be found at the bottom of the I'm Sorry page, and even more obscure, two rare episodes of The Jack Webb Show is part of the Jack Webb Collection. For more quiz show fun, see also: The Game Show Collection, Twenty Questions, You Bet Your Life, Quiz Kids, and Information Please. "It pays to be dumb, to be dense, to be ignorant" will be my ear worm for the day. Thats what I like, is excellent customer service, which is hard to find any more. Today when you call any of the large companies, for service, you get "Ring-around-the-rosie" from some clown from India! To me there are 3 important points in marketing, QUALITY, SERVICE, AND PRICE! Which you top all 3, but to me Service is the most important, because if you say you have the best Quality and Price, but can't deliver the product, what good is it. Like In computer games, where they say they are producing a great game, but never get in done "Vaporware" what good is the product, if they don't have the service to deliver. You (well, your recordings) have been my loyal companions on long road trips and overseas flights. I wish you continued success in your business. Those were the years....... when radio was our primary entertainment at home. In some ways it was an easier time. "Ignorant" is a personal favorite; glad to have so many now!